Ubertino de Casale (1259-1329) entered a Franciscan monastery in the Genoa region of Italy at age fourteen. By the turn of the century, Casale had developed his more radical beliefs. He believed in ‘absolute’ poverty and criticised the church, its’ Pope, and the Franciscans themselves. In 1305, the troublesome and argumentative monk was banished by his own order to an isolated monastery at Mount Alverna in central Italy. While there, in just over three months, he wrote his seminal work, Arbor vite (‘The Tree of the Crucified Life of Jesus’). In it, Casale writes of reform, renewal, and the apocalypse; and he criticises Popes Boniface VIII and Benedict XI, calling them ‘Beasts of the Apocalypse’. 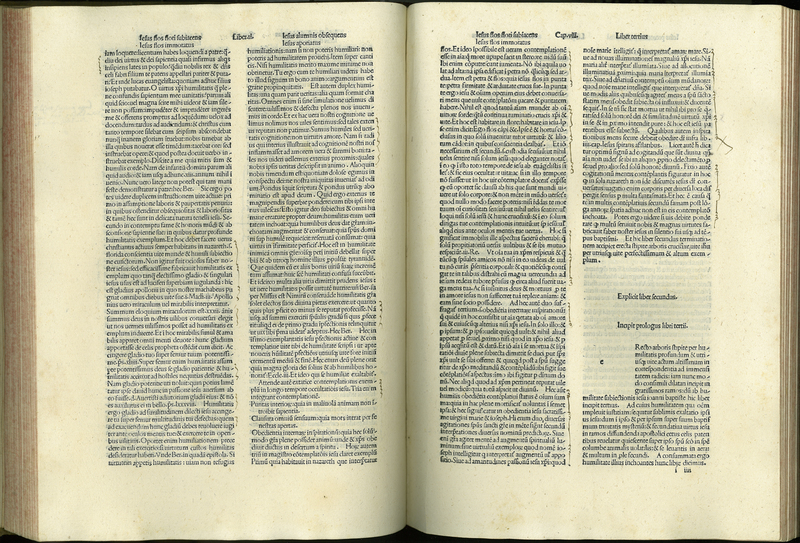 This work was printed in Venice in 1485. Someone has clearly read and marked this page, which shows the end of Book II and the beginning of Book III. Ubertino de Casale, “Arbor uite crucifixe Iesu,” ourheritage.ac.nz | OUR Heritage, accessed April 20, 2019, http://ourheritage.ac.nz/items/show/10333.